The big day has arrived; we are launching our long awaited iPad Guide App today! Over the past two weeks we elaborated on the map features and the content available on the App. Today we’d like to give you in-depth background on why we built this travel App and why we think it will change the way people navigate. If you are too curious to read further and want to see the App for yourself, you can go to the App website immediately or to iTunes to install it and start to play. 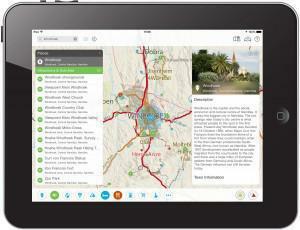 The generic App is free and contains samples of the map and guide information. If you like what you see, simply go to in-app purchases and get the full app functionality for the country that you want. At this stage Namibia and Botswana are available. 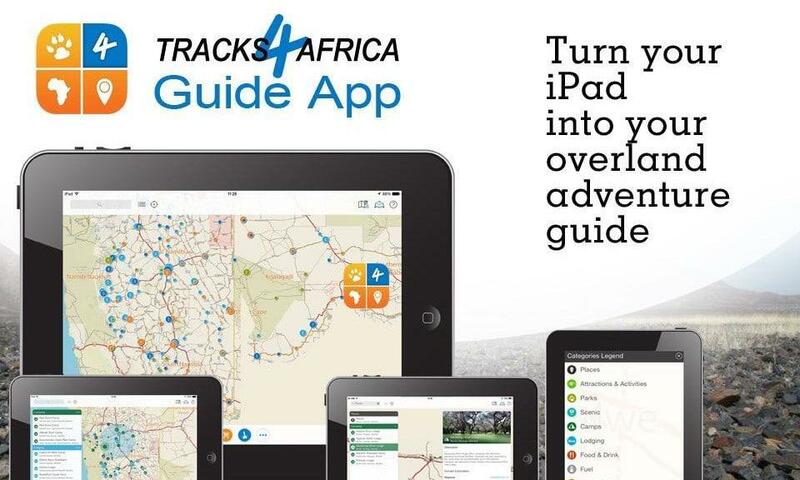 The new Tracks4Africa Guide App is a natural extension of our existing range of products. Our flagship product has always been a very detailed Garmin compatible GPS Africa map used by most self-drive travellers. It represents the travel experience of thousands of travellers over the last 15 years and remains a very relevant product. However, there are now newer and better ways to access information. Where do we sleep tonight? Where do we get fuel or other auto services? Where can we buy supplies or get something to eat? What can we see or do at a certain place? Where do we go in case of an emergency? These cover just about every aspect of your trip and because our data comes from the travellers themselves, this is exactly the kind of content we maintain on our maps and guides. Each medium, be it a GPS map, paper map, website or guide book plays a role in making content accessible. With the smartphone and more specifically the tablet, the technology used on the road by the modern day traveller has developed to such an extent that we had to rethink the way in which we make information accessible. Gregg Howard’s ‘carputer’ back in the day. Only technically minded people took the trouble of setting up a laptop and GPS connection with special software. The sometimes outdated paper maps we were obliged to use were built to a specific scale and weren’t suited to being used at other zoom levels. No point of interest data was available to search or provide additional information. The equipment was bulky and expensive so very few people were prepared to carry the technology or travel with these precious items. The iPad and other tablets converge many different technologies into one device, offering capabilities that didn’t exist 15 years ago. Tablets bring you a big enough screen, a fast enough processor, an integrated GPS, a camera and communication capability. Tracks4Africa had to rework its existing content to a suitable format that could be used on an iPad. The first thing we did was to design a good quality and visually appealing map, aimed at the needs of a self-drive traveller, which would be available offline. Mapbox allowed us to create a really compelling map experience which met all these criteria. You can read all about our map features in a previous article. We have a lot of data on our maps and on a normal GPS it is sometimes difficult to access all of it. It is easy to search for a specific campsite but challenging to find out what facilities that campsite offers. Our developers came up with clever ways to enable you to easily discover this content on the App. You can read about this in a previous article. Finally we combined your GPS location with the map so you can see where you are and orientate yourself on the map. If you think back to the old ‘carputer’ you realise how astonishing the new technology is. 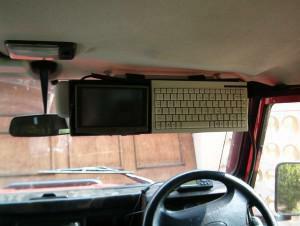 You now have great maps, points of interest information with rich content and your GPS location displayed as you drive. All of this is available offline and running on a slick, easy-to-use iPad. This is not a routing/navigation app, but even though it will not navigate you on a turn by turn basis to a destination, it automatically solves more than half of your navigation problems since it shows your location accurately on an excellent map, with good guide content, and it plots your intended destination with equal accuracy. The generic trial app does not contain detailed maps or content, only sample content so you can try it out before you buy. The available complete guides are sold as in-app purchases. You buy and download what you need for your trip. At present we have two country guides, Namibia and Botswana with more to follow. The map works like a web map and you can zoom via several layers of detail down to an approximate scale of 1: 150 000. The map is completely offline and can be used in the middle of nowhere without an internet connection. The guides are sold according to year e.g. Namibia 2015 edition. We will provide free updates for one year after it has been replaced by a new edition. In other words, if you buy the 2015 edition, you will receive updates throughout 2015 and 2016. You can obviously continue to use your existing guide for as long as you want. It does not expire. We envisage developing new features for this brand new product over time. Remember, Africa was not travelled in one day. We know that there are many Android users out there who would also like to have access to this App capability. We have every intention to bring out an Android version but it will only be released at a later stage. We would sincerely like to hear what you think of the App, so please let us know of your experience with this product and what you would like to see in subsequent releases. You can contact us at mailto:sales@tracks4africa.co.za or via our Facebook page. Hi there, I just downloaded your app for the iPhone. Maybe I am just too dumb but I can’t find the travel guide – all the details about camping, lodging, etc. I only get the map and the GPS stuff. What do I do wrong? Hi Johannes, I have send you a private mail to see which app you have and to assist direct. Hi Johann, I have a Microsoft Surface 3 tablet running Win 10 64 bit. Is there a Windows version availsble. This sounds like a great advance for travellers! Well done to the team. A great bunch of people. George. Is there any way to share a route between multiple devices ? Perfect way of serving and paying the community. I take this humble opportunity to recognize your immense and tremendous efforts in the innovation of the application. This goes along way in making life better for all of us. Congratulations for the innovation. The app detail is the same as on our other maps, have a look at the Tracks4Africa website map to ser the detail. We iclude the same Poi on the app as on our other products but with the app you get all the extra attributes as well. Johann, ek sal graag direk met jou wil kommunikeer oor die Guide App. Hoe en waar kan ek jou kontak? Johan, ek ry in April 2016 van Beitgrug na Bloubergstrand via Mapumalanga, Kwazulu-Natal en die Oos Kaap. Ek hoop julle App sal dan reg wees vir die iPhone, want ek sal dit as “backup” vir my GPS wil gebruik. ns wag net vir Apple om die ja-woord te gee. Teen April volgende jaar hoop ek om alreeds bietjie meer funksionaliteit ook beskikbaar te he. Ek toets in Oktober n prototipe wat jou instaat stel om plekke te merk en sodra jy aanlyn is, te stuur na jou rekening by T4A. Hi Chris, you must be one of the first people to try it out on a real trip! Thank you for the feedback. I am trying out South Africa (to be launched end of this month) in the Klein Karoo this weekend on my MTB. I have the test guide loaded to the test app for iPhone – hope all goes well. when do you plan to put out maps/guides for other countries? Which countries and when? Hi Rolfe, we are planning to release South Africa incl Lesotho and Swaziland in June. We should also be able to release most of the continent soon after, but we have not made a final decision if it will be per country or as small regions. I downloaded both Botswana and Namibia. I seems as though this truly replace the guide books. It contains all the information of the Botswana and Namibia book. Paging through the App makes you start planning your next holiday. What I do appreciate is the simplicity. Wish we could have it for the whole Africa. Publications like Lonely Planet – beware! Paid for the Namibia map, but it does not download. Arnulf, try to restore your purchase. I had a similar message this morning and upon restore it started the download. I think you may also need to be on Wifi and not 3G connection. The purchase however is logged against your iTunes account and can be restored at any time just like any other app purchase. Please also note that the transaction is handled by Apple via iTunes and we do not have access to individual transactions or user data, but we will assist where possible via our support channel with Apple. Why develop on IOS when majority SA is on Android? Justin, we did not look at generic stats when we made this call. We used analytics relevant to our users and I can assure you that the iPad is by a very long shot the most popular device interacting with us and other apps in our market. We have also interviewed other app publishers in this market, e.g. birding apps, and they have a similar experience. The ROI when developing an app is for most app developers the best on iOS. There is also another very big concern with distributing apps to Android and that is Google Play which today still not allow South African app publishers a way to monetize apps. In order to sell an app on Google Play we would have to use a proxy in an eligible country which is problematic and costly. When you weigh up all these factors then iPad still makes a lot more sense as a launch platform for a new app. You should also keep in mind that the first version of the app will go through a series of enhancements as it is impossible to say how users will react to certain functionality. Once this is done it becomes a lot less costly to develop the app for Android as well, i.e. not having to go through this iterative process on both platforms. Be assured that we will also develop for Android. Thanx Johann, I can’t wait for the Android version. We have all the SA birding, mammals, snakes, etc. guides already on Android. According to our local VODASHOP they are selling way more Android phones than Apple. Please let T4A not be a part of the battle between Apple and Android. Though I am trying to understand your predicament with Google Play, there is lots of SA developed products already on Google Play. Hi Sarel, I appreciate your loyal support. 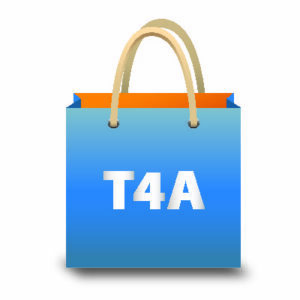 Please accept that T4A is in no way involved with a plot against Android, we are also users of Android devices. The fact that there are more Android phones selling around the world does not have any bearing on our decision. This app is intended for tablet use as the mapping experience on a phone is severly inhibited. As I mentioned we will develop an Android version but we had to launch on a particular OS and I can assure you when it comes to penetration ito sales iOS still remains the leader. This is particularly true for the market we are developing for and evident from our own analytics. If I could I would have launched both at the same time but we are putting a huge investment into this app had to decide on one to launch with. Hi Ulrik, yes we have every intention to launch Android as well, but it will be a while before we develop it for this platform. I have had an App of yours on my iPad for I guess a year now. What is different about this new App? Hi Alan, the new app is not a navigation system with turn-by-turn instructions and route calculation like the one you are referring to. The new app fills a gap between a navigation GPS and paper based products. The map experience you get with this app is very much like a paper map, only better because you can view it at different zoom levels. The POI content is much easier to discover and it comes with rich content in an easy to use UX. It is a paper map and a guide book wrapped into a digital format if you like. It does use your GPDS to display where you are as well, which also assist with the search filter. You can try it out for free and see for yourself. I don’t want to use Ipad but have been using Android phones and tablets for years wil you be launching an App for users of andoid as well.